Product review: Excellent experience – by Benjamin, 6 Jan 15 5/5 Excellent "When we called the airfield the staff where incredibly friendly and happy to help us in anyway for finding a convineint date. The venue was very easy to find with the sat nav, the airfield was well signposted. The staff where incredibly friendly they helped us with any queries we had/problems. The equipment they had was great, all increadably safe and up to date! The briefing was short and sweet, the instructor went through all the basics of understanding how to fly a plane. He even brought a little wooden model with the moving parts of theplane to demonstrate how to use the controls. My experience was unbelievable I never thought I would have that much fun! Was extremely thrilling because I was allowed to fly 99% of the time. My instructor was very friendly and helped me fly the plane during the whole flight! After the flight the instructer went over the flight and told me how to improve my flying. I had time to take pictures and answers any questions I had. " On arrival, you will be greeted by a member of staff who will be glad to offer you tea or coffee as they introduce you to your Flying Instructor. Once you have completed the necessary paperwork formalities, met your instructor and booked out, you will head to the apron where your instructor will walk you round your aircraft explaining how to control it in flight, before climbing aboard, starting up and taxiing out for your lesson. Very shortly after take off, you will be offered the controls of the aircraft under expert guidance from your Instructor. You will be shown what all the instruments are for and what information they give us and how we navigate our way around the sky! Also, don't forget to bring your Camcorder or Camera to record your lesson! Once back on the ground, your Instructor will answer any questions you may have about flying or further training. You will also receive your commemorative certificate, signed by your Instructor. The flight operator reserves the right to specify the date and time of the flight. No guarantee can be given that any flight booked for a specific date or time will be carried out on that date or time. The flight operator must be informed of any disability or previous/ongoing medical condition which should be reasonably disclosed. Passengers must be aged 12 years or over or at the Pilot-in-Command's discretion. After the voucher expiration date, then flights may continue however, the length and date of flight cannot be guaranteed and extra costs may be incurred from possible increases in fuel, handling, overheads, airport charges and V.A.T. rate. Bishops Waltham, Hampshire, SO32 1HA. What to give an aircraft nut (me) for a birthday present? 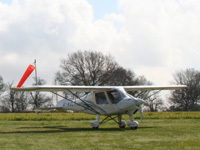 A flight in an Ikarus C42 from Upham, my local airfield in Hampshire.The voucher arrived by email minutes after paying, and I phoned the operator to book the same day, a Friday. What a fine bunch of chaps...across the Solent to the Needles, over Newport IoW and then back to Upham for a cup of very good coffee. I highly recommend the entire process from booking, flying the aircraft to the cup of coffee. The only danger is that once you have flown an Ikarus, you'll be hooked. I'm still grinning. When we called the airfield the staff where incredibly friendly and happy to help us in anyway for finding a convineint date. The venue was very easy to find with the sat nav, the airfield was well signposted. The staff where incredibly friendly they helped us with any queries we had/problems. The equipment they had was great, all increadably safe and up to date! The briefing was short and sweet, the instructor went through all the basics of understanding how to fly a plane. He even brought a little wooden model with the moving parts of theplane to demonstrate how to use the controls. My experience was unbelievable I never thought I would have that much fun! Was extremely thrilling because I was allowed to fly 99% of the time. My instructor was very friendly and helped me fly the plane during the whole flight! After the flight the instructer went over the flight and told me how to improve my flying. I had time to take pictures and answers any questions I had.